...a place to play or just relax and getaway. "The Pearl of the Northwest". Forks of the wild and scenic Smith River. A grove of majestice Redwood trees along a hiking trail. ACCOMMODATIONS- Our guests stay in an upstairs living area that includes an updated kitchen & bathroom. Enjoy a view of our wooded acreage, with the sounds of the ocean and wildlife ever present during the day and night. It's a short walk to the beach access. Bicycles are also available for our guests to enjoy a ride along Pebble Beach and view the wildlife refuge, Castle Island. 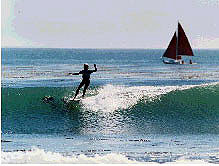 Or just relax in the quiet peacefulness of our little corner of Del Norte County, "the Pearl of the Northwest". Upon arrival our guests relax and enjoy beverages with our hosts who can assist with dinner plans and information about things to do and see in our area. The upstairs living area has a flat screen TV with blue ray player, dining area and fully stocked kitchen with granite countertops and stainless steel appliances. The upstairs bedroom has a queen bed with a pillow top for added comfort. The windows offer views of the wooded acreage, sounds of the ocean and a view of our local wild life. There is ample closet space for extended stays. There is a second bedroom downstairs with a daybed that converts to two single beds and may be set up side by side or not, depending on our guest's needs. Additionally, there is a bathroom and laundry area downstairs. The weather of the area is visible to the east and west, to allow our guests the opportunity to plan their day accordingly. Being in a coastal town, the ocean is a determing factor, and offers exciting storms and beautiful sunsets! THINGS TO DO- Our spring and summer activities include biking, kayaking, sailing, surfing, as well as wild flower and wildlife viewing. Salmon and steelhead fishing is available October through February and whale watching occurs December through March. The arrival of the Aleutian Canada Geese to Castle Island as they migrate north is a spectacular event from February through March. 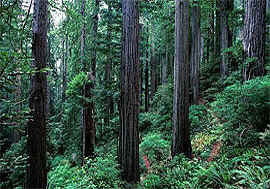 Nature is abundant in Del Norte County all year long. 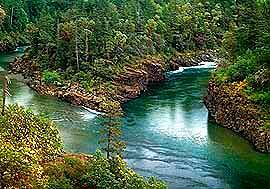 The area is also known for the pristine beauty of the famous wild and scenic Smith River gorge, a fifteen minute drive east on highway 199 from our beach home. 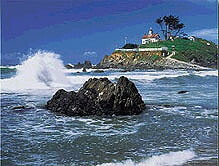 Tour Battery Point Lighthouse, tides permitting or go beachcombing, sailing or surfing. Our winter and spring seasons offer our guests the experience of exciting north coast storms and a chance to watch the migration of the Aleutian Geese as well as various whale species to our beautiful area. The easy beach access offers our guests the chance to explore tide pools and view spectacular sunsets from Pebble Beach. Lodging rates range from $125 (low season) to $150 (high season) plus 8% required county bed tax and a non-refundable cleaning fee per stay - $60. Extended stay cleaning fee varies & requires a security deposit. Castle Island Getaway is a non-smoking establishment and we regret we are not able to accommodate pets. One night's stay is required as a deposit and fully refundable with a one week written cancellation notice. Check in is 3:00 PM - Check out is 11:00 AM - Reservations by phone or email are highly recommended. Be sure to ask about obtaining a complimentary travel packet of the area prior to your stay and we will have it either mailed to you or available upon your arrival.